Shipping in a neat carry case, we were hoping this 2.1 speaker set would be specifically designed for the mobile user. Sadly, they need mains power to run. This is largely due to the heavy-duty subwoofer that accompanies the two satellites. 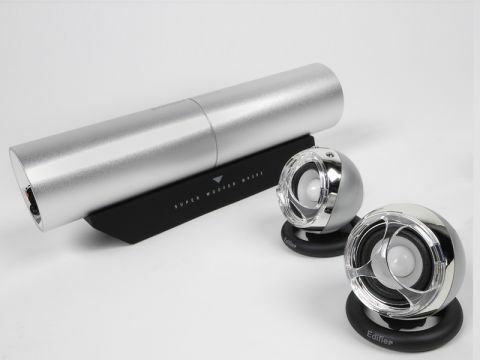 Setup is easy, as you simply plug the sub-woofer into the mains, attach the single connector from the satellites and hook up to your laptop. The bass unit has a 2-inch speaker and sits in a long barrel, while the 1.5-inch satellites are attached by a thick cable. The sound quality for a straight analogue connection from the laptop's headphone socket was more than acceptable. The sub-woofer really adds bass, while the satellites offer plenty of treble and volume.